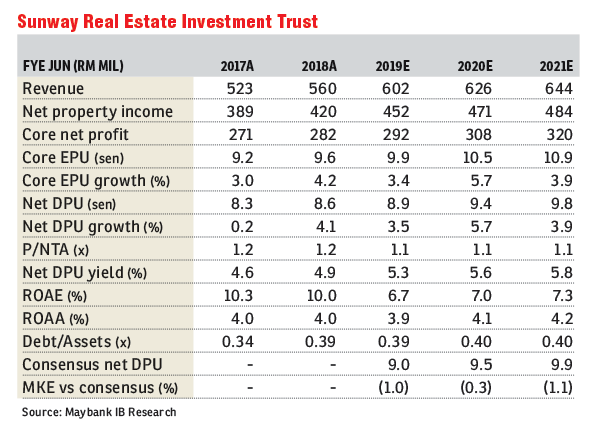 Maintain buy with a target price (TP) of RM1.85: Sunway Real Estate Investment Trust’s (REIT) first quarter of the financial year ending June 30, 2019 (1QFY19) results and first interim gross distribution per unit of 2.48 sen were in line. The softer year-on-year (y-o-y) earnings were largely due to Sunway Resort Hotel & Spa’s temporary refurbishment works but partly mitigated by Sunway Pyramid’s sustained performance and new asset contributions. We retain our earnings forecasts and dividend discount model based-TP of RM1.85 (cost of equity: 7.9%). There was a temporary disruption at Sunway Resort Hotel & Spa. Excluding a fair value gain of long-term liabilities of just RM25,000, 1QFY19 core net profit was RM73 million (-7% y-o-y; +15% quarter-on-quarter), making up 25%/24% of our/consensus full-year FY19 estimates. 1QFY19’s softer y-o-y core earnings were mainly dragged by lower occupancy rates and meeting, incentive, conference and exhibition activities at Sunway Resort Hotel & Spa due to ongoing refurbishment works (commenced in July 2018 and expected to be completed by 2QFY19), lower revenue and occupancy rates of Sunway Putra Hotel as 1QFY18’s performance was lifted by one-off contributions from the Southeast Asian Games and Asean Paralympic Games, lower average rental rates at Sunway Putra Mall, higher maintenance costs at Sunway Carnival and steeper borrowing costs from higher drawdowns of loans and higher cost of debt. However, earnings were partly supported by Sunway Pyramid’s sustained occupancy and higher rental rates, and new asset contributions (Sunway Clio Property and Sunway REIT Industrial). Our estimates are unchanged. We have maintained our earnings forecasts at this juncture, pending further clarity on Sunway Resort Hotel & Spa’s performance post refurbishment works. Our near-term growth estimate is still mainly supported by Sunway Pyramid. On mid- to long-term acquisition mode: We have remained positive on Sunway REIT’s rich pipeline of assets from its sponsor which will enable Sunway REIT to diversify its portfolio further into other prospective segments. We understand this could include segments such as industrial and education. End-1QFY19 gross gearing was 0.39 times.